As I perused my blog entries the other day, I noticed that I’d been writing primarily about FMEA fundamentals. This isn’t a bad thing per-se, but it does exclude a whole realm of other topics that are of interest to our APIS readership. 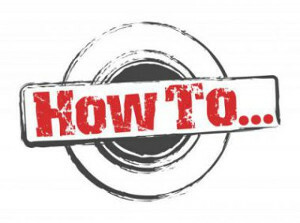 So I’m decidedly switching gears to a more of a “how to” and “tips and tricks” theme. Just so you know going in, this is a relatively high-level concept for advanced users. Don’t be afraid. Read on and maybe you’ll find yourself among those experts in knowledge and skill! This entry addresses the functionality of “Faded-In” Actions in the APIS IQ Software which are very useful in the FMEA formsheet. (For the uninitiated, the Actions I refer to are the preventive & detection activities which are there (respectively) to minimize or mitigate a failure from occurring and detect its presence during product or process development. “Why should I care about this?” you might say. It depends on how much of a stickler you are for detail in your FMEA and how firmly you hold to your convictions on the “rules” of your analysis. Some of us need more order (you know who you are); we simply need to have all our pencils laying on the desk pointing in the same direction. If you don’t care about that, maybe I can spark your interest in how the Faded-In actions can cut the effort to manage your FMEA actions by at least 50% if not more! I’m often asked, “How do I know where to put my preventative & detection (P&D) actions in my structure? In all my training sessions and facilitations, I teach that the preventative and detection actions tell you where they go…if you just listen to them. Consider the simple system with a piston in cylinder with an O-ring seal. With this kind of system, we’re likely to have the detection action like, “System Durability Test,” which pressurizes the system a specified number of cycles under various extreme environmental conditions. The test will indicate if the system fails to perform (e.g., leaks pressure). The test won’t indicate which component is responsible (e.g., piston failure, seal failure, etc.). Therefore, the detection action should be anchored at the system, not the component. 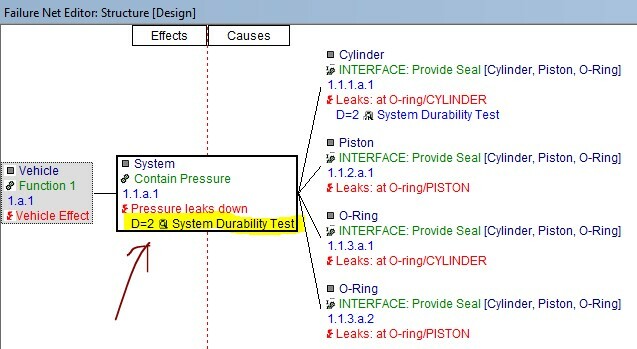 If we anchor the action as I’ve prescribed, we’d have a problem with an FMEA formsheet established at the System (system element 1.1); the testing we’ve taken such care to perform to demonstrate that the system holds pressure won’t show up on our formsheet because only the actions anchored at the failure cause are displayed. We need to demonstrate coverage for all the excellent robust-design work that we’ve done somehow. We could copy and paste the detection action “System Durability Test” at the Cause 1.1.1.a, but that would mean we’d have to copy it to THREE places! Further, we’d now have FOUR places to keep track of that object. Things don’t seem to be moving in the right direction do they! In its simplest terms, the Faded-In Action addresses our need to have (preventative or detection) actions anchored at a single location, but referenced (like a desktop shortcut on your computer) at other locations. 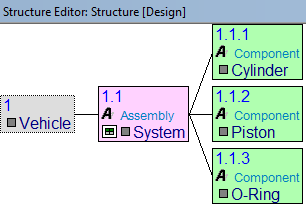 In other words, we can place our action, “System Level Test” in the appropriate location at the assembly-level system element 1.1.a, and FADE-IN the action to our three component level locations. There are almost always multiple ways to perform an operation in the IQ-Software. In this case, I’ll offer two of the easiest ways to fade in the actions. The first is via the IQ Software “smart-drag” feature, which is a <right-click> + drag-n-drop. To perform the operation, right-click on System Durability Test in the Structure Editor in the primary workspace, then drop the action at the destination detection action cell in the formsheet of the secondary workspace below. When the mouse button is released at the destination, the IQ Software will present the option to Fade in actions at the destination. Selecting the Fade in actions we see that the action is now in blue font along with all associated data; dates, responsible, and completion status information from the source! Could it get any better?…This IS the APIS software! So yes, it gets better. If we look into this example more closely, we’ll notice that the failure net graphically illustrates several component-level causes anchored at the system-level component that we tested. Results in the menu option Show action(s) at linked causes which Fades in the selected action(s) at each failure cause! In our example, the action can remain anchored and maintained at the System level of the structure but recognized at FOUR failure cause (component) locations. That’s a very significant reduction in information to maintain! Indeed, a bit of a longer blog, but I hope I’ve left you with the satisfaction of order and efficiency in your FMEAs! Now all good things must come to an end…that is until my next post where you’ll learn how to show Action(s) as linked causes. Carry on! 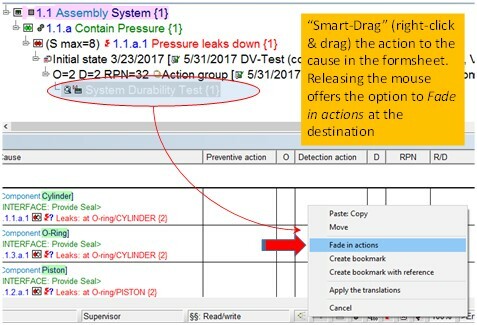 Note – the FMEA formsheet Display Options | Options II | Context information for actions should be enabled as shown to ensure that the context information of the parent function & failure of the faded in action is shown.